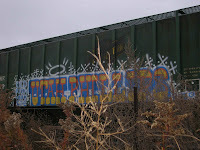 There are books I borrow from the library or browse in bookstores that reproduce some great vandalism, but most of what I see in the freight yards is pretty lame. Maybe the bosses snag the good ones for their collections. Imagine it: Beautiful kidney-shaped pool, plantings by Helmut Jahn, trophy wife sipping wheat grass on the chaise longue. 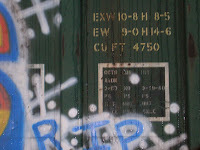 And changing rooms built into a graffitied boxcar! I finally noticed something worth noticing. Nice design, good simple colors and execution, sentiment, but not sentimentality. It made the grain car look better than before. Utah Phillips (b. 1935, d. 2008) was a hobo, storyteller, folksinger, and activist. 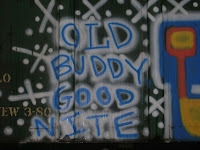 He rode the rails after coming back from Korea with PTSD, got mixed up with anarchist-Dorothy Day associate Amman Hennacy, and was a personal friend of righteous babe, Ani DeFranco.